The end of the war could integrate Colombia more fully into Latin America. There’s still a lot to work out—on land, disarmament, refugees, paramilitary power—and many things can go wrong, but it seems Colombia’s decades-long civil war is ending. 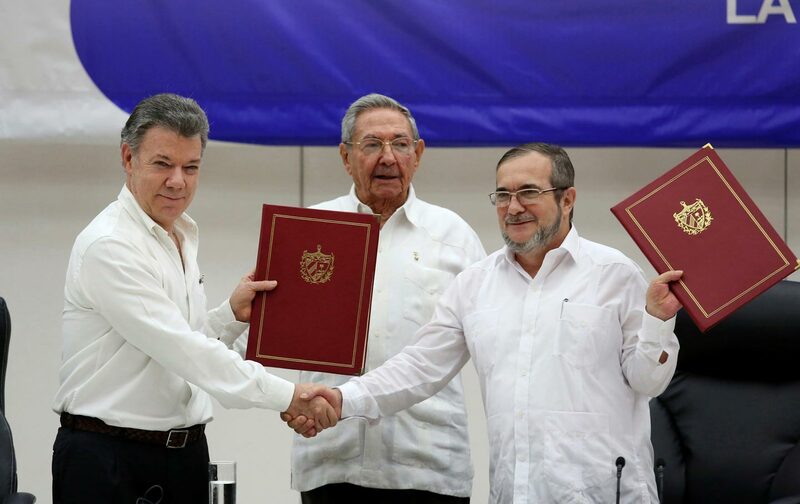 The Colombian government and the Revolutionary Armed Forces of Colombia (FARC) have announced that they “have successfully reached an agreement for a definitive bilateral ceasefire and end to hostilities.” Depending on how you date it, you could say the war has been raging since the early 1960s, 1948, or even as far back as the 1920s. Fighting started well before TV was a household item, when few Colombians owned telephones. Now it’s ending with a tweet: “On Thursday, June 23, we will announce the last day of the war,” FARC commander Carlos Lozada wrote to his followers on Twitter. The Nation has covered Colombia well over the many decades of the war. Last October, Winifred Tate and I discussed what was at stake—especially around land, paramilitary power, and internal refugees, of which Colombia has millions—in the peace talks, and what obstacles might sideline them. Here, I discussed a story not reported in the US press, of the at least 54 Colombian children sexually abused by US soldiers and contractors. Six years ago, Teo Ballvé did an excellent report for the magazine on the “dark side of Plan Colombia,” on how the billions of dollars authorized for Colombia by Clinton, and continued under Bush and Obama, helped narco-traffickers steal massive amounts of land to plant crops for biofuels. Going back to 1948, the journalist Herbert Matthews, also in these pages, wrote that the assassination of left-liberal leader Jorge Gaitán was a “lighted match dropped into an open gasoline tin.” He was right. Days of rioting gave way to decades of civil war, hundreds of thousands of lives lost, millions driven out of their homes, a fire only now hopefully doused. If you search for Colombia on The Nation’s website, you will see how key the country has been in regional politics. Returned stories come back on Cuba, Iran/Contra, Panama, Israel, immigration, drugs, Central America, death squads, Iraq, private security forces, and so on, giving an indication of the key role Colombia, and its war, has played on the larger foreign stage, particularly in the paramilitarization of global politics that took place with the rise of the New Right in the United States. Colombia was to broader Latin America, a good analogy goes, what Israel is to the broader Middle East, a stalking-horse proxy that has allowed Washington to project its power into a critical region. The end of the war promises to change that relation, perhaps integrating Colombia more fully into Latin America, a process that picked up steam with the election of the current president, Juan Manuel Santos. The peace process has reached a point of no return. Peace is a victory for all of Colombia, but also a victory for Our America. The short history of the Community of Latin American and Caribbean States has led to the proclamation of this region as a Zone of Peace.… The achievement of peace in Colombia represents a hope for millions of people on the planet, whose main concern continues to be human survival in a world shake by violence and wars. Peace is not a utopia; it is a legitimate right of every human being and of all peoples. It is a fundamental condition for the enjoyment of all human rights, particularly the supreme right to life. Quoting José Martí, Castro ended his remarks by insisting that “homeland is humanity” (a good sentiment to keep in mind, considering events on the other side of the Atlantic).